I was at first a reluctant convert to Twitter. It took a fair amount of cajoling from academic colleagues here in Manchester, before I took my first tentative steps into the Twittersphere. My first foray was short-lived. Signing up early in 2012, I immediately encountered the unique language of Twitter. I found the notion of “followers” and “following” a little disconcerting. I heard myself shouting inwardly “I don’t want to be anybody’s follower. I am an independent free thinking individual”. This sense of being a follower of a particular individual, and worse still, being defined in part by the number of Twitter followers that you have seemed to embody and promote the contemporary cult of celebrity in a way that I found slightly uncomfortable. I promptly closed the Twitter App on my phone and moved on to more substantive items on my To Do List. A couple of months later I tried again, after another conversation with a colleague, who was very clear in his mind that Twitter was not about following the inane and trivial outpourings of the famous and obscure alike but was to be viewed more as a valuable, fast, easily accessible and digestible source of information on topics of interest. This was the hook I needed to embrace Twitter, and almost one year on I am a real fan – my husband would say addict – of the ubiquitous micro-blogging site. So what have I learned from Twitter and what are my tips for engaging with it from the perspective of a University Lecturer. 1. Twitter exists as a parallel universe of information and discourse – once you have begun to explore its richness in terms of information and access to people, then you do begin to wonder what you did in those pre-Twitter days. I follow organisations related to my research and teaching interests, general media outlets and journalists that I particularly respect. I follow academic colleagues both at the University of Manchester and beyond. I follow a few famous people, but only those who tweet sensibly and in moderation– verbal incontinence on Twitter is a real turn off for me. I also follow a number of friends, and organisations and individuals in areas in which I am personally interested. 2. As a Twitter user you sit at the centre of your own personal Twitter universe – Your profile, your followers, people you are following and your contributions (in terms of tweets) are displayed very visually and there is the temptation to become more obsessed than is perhaps healthy about how many followers you have, what successes other people are enjoying etc . Twitter is also a wonderful platform for self-promotion. No one can stop you sharing your latest achievement, whether it relates to a stunning conference speech, publication of a journal article or receipt of research funding. Whilst it can be argued that the demands of the REF, career advancement etc. demand such a self-promoting approach, I think a balanced mixture of both humble and hubristic tweets is more appropriate and a more honest reflection of our professional lives. 3. Twitter can be used for several purposes as a University Lecturer. I use it to communicate with my students – reminding them of deadlines, alerting them to articles or websites of interest and asking them for their opinion on various matters. I also use it to share articles, news and events with my academic colleagues. I have tweeted, hopefully sensibly and in moderation, on topics as broad as project uncertainty in the nuclear industry, using social media in Higher Education, the challenges of being a working mum, and pictures of my favourite locations on Scottish Islands! c. you would be happy to see on the front pages of The Sun – Heaven forbid ! 5. This leads me onto my last point. Does our identity on Twitter reflect our real identity(ies)? Recognising that I have several identities – lecturer, wife, mum, friend, Christian etc – to what extent are my Tweets an accurate portrayal of my many identities? How do we balance the need for privacy with the need to be honest? In the physical world we can overcome this issue by sharing certain stuff with friends, and other stuff with professional colleagues – and for the most part these two identities can be kept quite distinct. But how do we achieve this on-line where all our tweets are accessible to anyone who chooses to follow me? This is a dilemma that I have not yet resolved. I try to be real and honest on Twitter, but I am definitely guarded about what I share – As a consequence my Twitter identity is only a pale, pale shadow of my full identity, but perhaps this is just as well! Be discriminating: both in who you follow and what you tweet. The alternative can be information overload and a triumph of quantity over quality. Think through your identity on Twitter – are you tweeting in a professional or personal capacity. What does this mean for the topics that you will tweet about? Twitter is addictive – be aware that it can occupy all spare moments, especially if you have a smartphone or tablet to hand! Follow your professional colleagues to start off with and look at who they follow for ideas on who to follow. Think before you tweet – If a comment or opinion is better off kept to yourself, or at best shared only with your partner on the sofa then please don’t tweet it. This guide published by LSE is a really good introduction to Twitter and how to use it in a professional capacity. 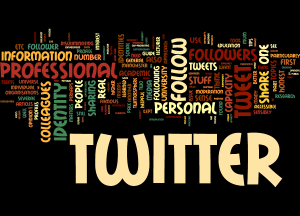 Do you tweet – if so in a personal or professional capacity, or are you comfortable mixing the two? What do you see as the main strength of Twitter in Higher Education? How do you avoid becoming self-absorbed and self-obsessed when sharing your thoughts, trials and tribulations and achievements in a very public medium?